I have been sharing a series of sermons with my church family (www.libertybaptistchurch.ws) entitled The Walk. The Bible uses the metaphor of walking more than 200 times to describe the way one does life. As I stated in a previous post entitled (What You are Missing by Googling God), the metaphor is fitting because walking, in Biblical times, was a way of life. Last year, while driving, I passed a man dressed in military fatigues carrying an American flag. I noticed him, but I moved on quickly and gave it very little thought. The next day I saw the same man standing with a group of people on a street corner in a different town, at least 15 miles from where I had seen him the day before. That weekend I was hosting a retreat for a group of leaders at a facility located at the summit of a mountain. As I left the retreat center that Saturday, guess what I saw. Same guy, same flag, only now miles away, and 3,000 feet above the town where I had seen him just a few days before. 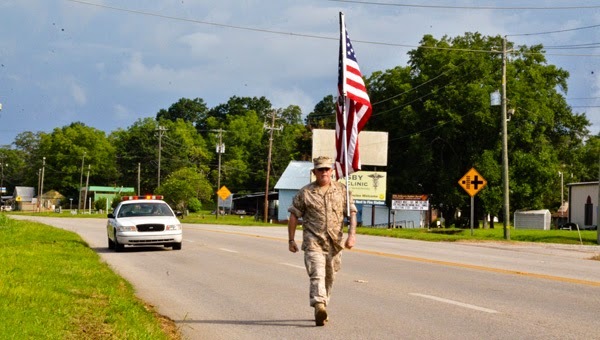 After doing some research I found out that his name is Mac McQuown and he is on a journey to visit the capital buildings of all 50 states and raise awareness about the needs of US military veterans. As of 4/6/2014 Mac had completed more than 2,800 miles of a walk that will take him at least 6 years to complete. As much as we enjoy those miracle stories of conversion in which someone is drastically and radically changed, it is important to understand that the Christian life is not so much about the miracle moments as it is about progress. I pray for certain things in my life to happen quickly, but they rarely do. The interest God has in my life has less to do with the momentous and more to do with the mundane. There is nothing more mundane than walking. Small amounts of incremental change leads to great amounts of progress. The Christian life is very pedestrian. It is about steady progress. It is not about majoring on what happened to me “one incredible day” it is about the way I am thinking, behaving, and doing life EVERYDAY. The Biblical metaphor of walking is powerful because it teaches us not only about the pace of progress, but it teaches us that God expects us to infuse Biblical truth into everything we do, no matter how pedestrian it may be. Mac’s walk helped me to realize that drastic changes occur step by step. As I drove past him the first day I only took brief notice of his walk. I literally only saw a few steps and I moved on, but so did he. Three days later, as I turned to drive down the mountain I had a stunning realization, while I slept, ate, and “did life” Mac kept walking. In three days, he had made it further than me. Apparently he continues to move along. I am still here. What you do everyday makes a huge difference. Just make progress.